Should Non-Disclosure Agreements be Illegal? In the wake of recent sexual harassment news, Prof. Bennett L. Gershman, of the Elisabeth Haub School of Law at Pace University, argues that private civil settlements that involve non-disclosure should be illegal. 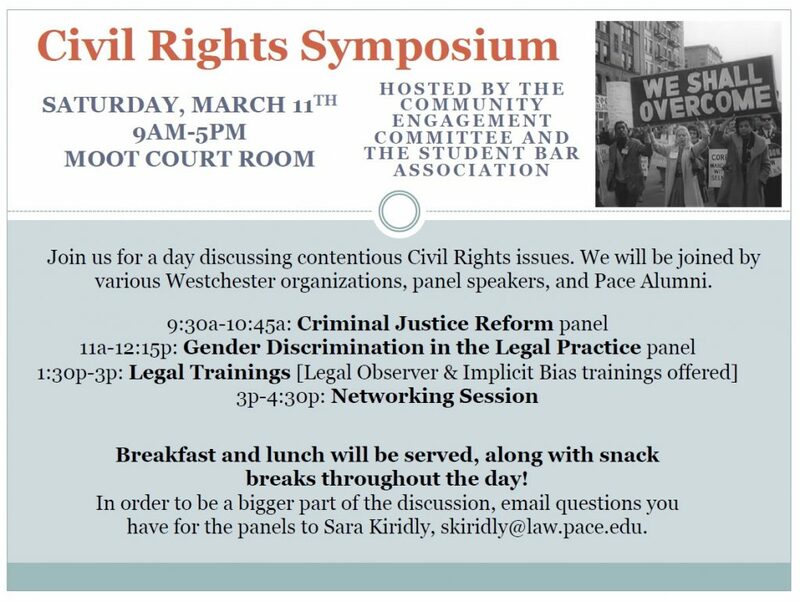 Please join the Community Engagement Committee and the SBA at Elisabeth Haub School of Law, Pace University, for a full day Civil Rights Symposium on Saturday, March 11, 2017 at 9:00 AM – 5:00 PM in the Moot Court Room. Kenneth Chamberlain Jr. – Leader of the Westchester Coalition for Police Reform, and outspoken advocate for police reform within the greater Westchester region. Eugene O’Donnell, J.D. – Professor and former NYPD officer. Previously served in the Queens and Brooklyn DA’s offices. Nationally recognized expert on policing issues, including use of force. Professor Linda Fentiman, J.D. – Her most recent work has focused on women and addiction. In 2010 she was a Visiting Scholar at the Center for Reproductive Rights in New York. Anne Golden, J.D. – Co-founder of Outten & Golden LLP, and co-chaired the firm’s discrimination and retaliation practice group. Steven Felsenfeld, J.D. –Over 20 years of labor and employment law practice experience, advising and litigating multiple sexual harassment matters. He has created and conducted sexual harassment training, and created multiple employee handbooks. Certified senior professional in Human Resources. deal-making has long been done in Albany by ‘three men in a room’ (the governor, the State Assembly speaker and the State Senate majority leader), who work in secret and without accountability to decide [the states] most vital issues. On May 12, 2015 New York Senate Majority Leader, Republican Dean Skelos vacated his post amidst a criminal complaint filed for federal charges involving fraud, extortion, and solicitation of gratuities and bribes. On January 21, 2015, the Former Speaker of the New York State Assembly Sheldon Silver, Assemblyman since 1976 and continuously re-elected speaker since 1994, was indicted on several criminal corruption charges using his political power and influence that netted him $4 million in payoffs. Mr. Silver, a Democrat from the Lower East Side of Manhattan, was accussed of steering real estate developers to a law firm that paid him kickbacks. He was also accused of funneling state grants to a doctor who referred claims to a second law firm that employed Mr. Silver and paid him fees for referring clients. Mr. Silver has resigned from his position as Speaker and is currently awaiting trial to defend himself against the federal charges. The exposure of Mr. Silver’s conduct brings Governor Andrew Cuomo’s termination of the Moreland Commission back into the spotlight. The anti-corruption panel was set up to investigate public corruption in New York State and was disbanded after it began looking at the behaviors of certain law firms tied to the governor and Mr. Silver. Over the past few years, the New York Legislature has been infested with corruption and political misconduct. On February 5, 2015, Mr. Silver and former New York State Assemblyman, Vito Lopez, settled a sexual harassment lawsuit for $580,000 using state funds to pay over 90% of the settlement. William Scarborough resigned from his position and plead guilty to corruption charges in April 2015. Bronx politician Nelson Castro was sentenced to two years probation and 250 community service hours after pleading guilty for lying to investigators. Due to Castro’s cooperation, Eric Stevenson was convicted and sentenced to three years in prison for accepting bribes from businessmen in May 2014. In October 2014 Gabriela Rosa was sentenced to a year in prison after pleading guilty for making false statements in a bankruptcy petition and lying to authorities regarding her marital relationship. William Boyland was convicted in March 2014 on federal charges including bribery, extortion and mail fraud. In February 2014, Malcolm Smith was found guilty of conspiracy, wire fraud, bribery, and extortion when he attempted to scheme his way onto the ballot. In July 2014 Thomas Libous was indicted for lying to federal agents in regards to abusing his political influence in order to obtain a job for his son. In 2013 Pedro Espada Jr. was sentenced to five years in prison for stealing hundreds of thousands of dollars from a health care network he ran. In 2012 Nick Spano, after pleading guilty to a felony for filing fraudulent tax returns, served one year in prison. Amidst all the public corruption and political misconduct in New York State, the question becomes – can we trust our elected officials? Regardless of political party, can the citizens of New York rely on politicians to uphold their offices with honesty and integrity? Do we really know if our representatives have the public’s interest at heart when they are conducting “business” behind closed doors? Given the recent developments the answer appears to be NO. it is feared that a convention might take steps to diminish the legislature’s institutional power or incumbents’ chances of re-election. Citizens of the state with honest motives, ethics and morals would have the opportunity to run for delegates for the Convention to redesign the New York State government. While many obstacles would be met if a Constitutional Convention were to take place, it is a legitimate opportunity to rid the state of corrupt politicians. Action should be taken in order to change the New York political system and restore the integrity of the State. If nothing changes, nothing changes; public corruption and political misconduct will continue to run rampant within our state and voters will only have themselves to blame.